Need to purchase a gift card online? CLICK HERE! 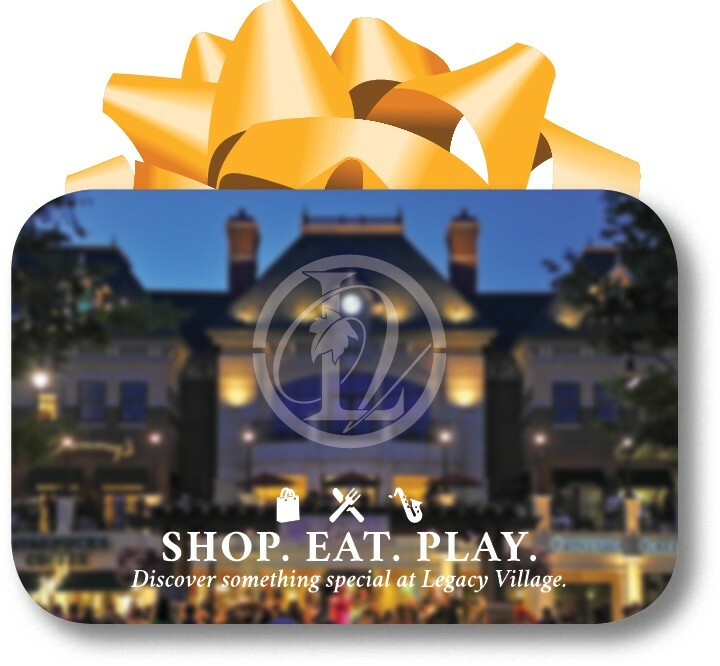 Make Gift Giving Simple with a Legacy Village Gift Card! Legacy Village Gift Cards are always the right choice. They’re accepted at most* Legacy Village shops and restaurants and are available in any denomination from $5 – $500! *Currently, gift cards are not accepted at LA Fitness, Sola Salon Studios or Charming Charlie. They are accepted at all other Legacy Village shops and restaurants, including Giant Eagle. **Please note there is a $1 activation fee per gift card at the gift card kiosk. ***There is a $3 activation fee per gift card for ONLINE purchases. Monday – Friday from 9 a.m. – 5 p.m.
No personal checks will be accepted. If you are a company wishing to purchase a large quantity and pay with a check, please prearrange your transaction by contacting the management office at (216) 382-3871. Please visit GetMyBalance.com to check the available balance on your Legacy Village Gift Card.